ago. I had originally thought I would use them in embroidery but that never happened. 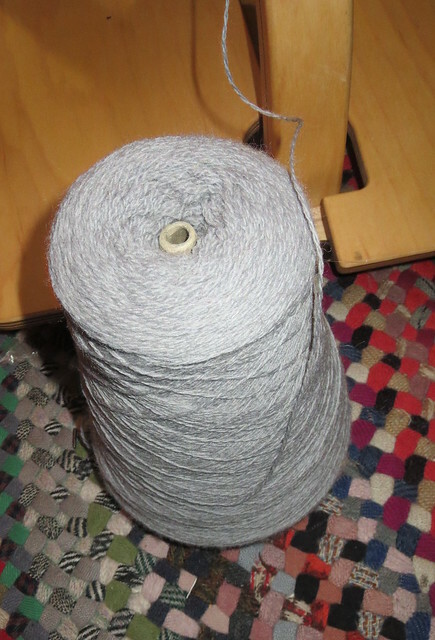 I also had this cone of wool in lace weight also from a thrift store a while back. Between the two items I spent about 4 dollars so no big investment to say the least. I was straightening up my project area and the basket that held the yarn samples tipped over and fell next to some purple roving. 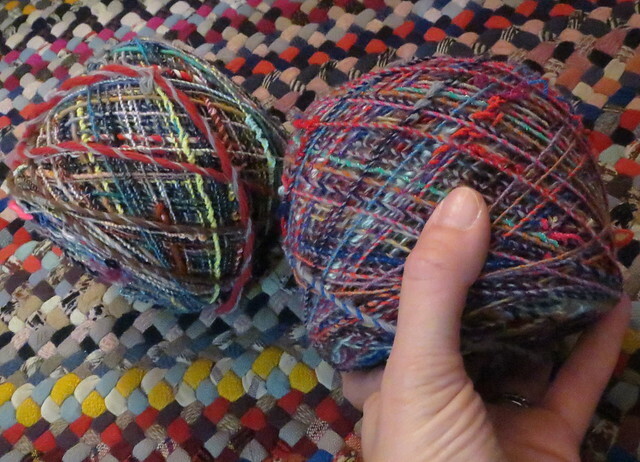 A thought quickly ran through my head that I could spin the samples the same as I would roving and make 1 long piece of usable yarn that was multicolored and funky with a life of its own just like the rugs in my home that I make. 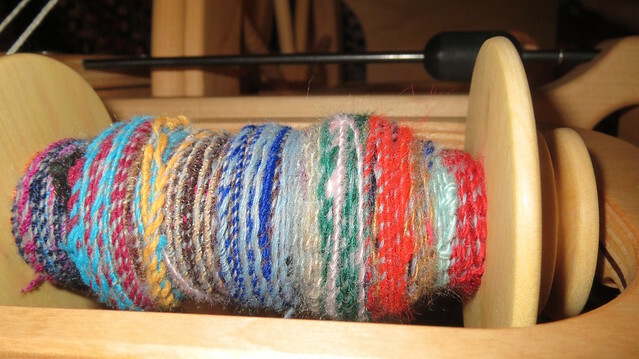 So I pulled out my spinning wheel found some gray wool lace weight and set to work removing the yarn from the sample cards. 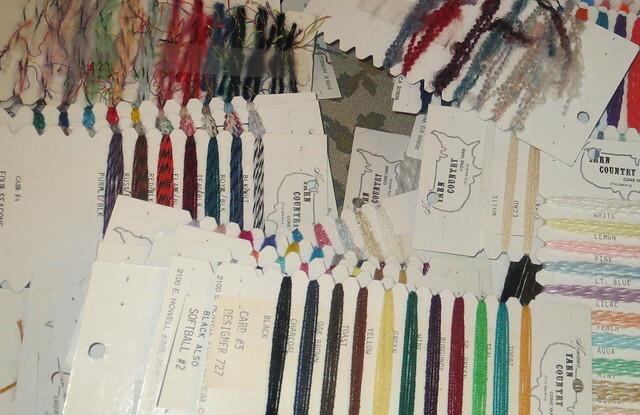 These samples are from the 80's so some of them are day glow colors ( ie neon) should be interesting when all knit up with a scary color like that here and there. 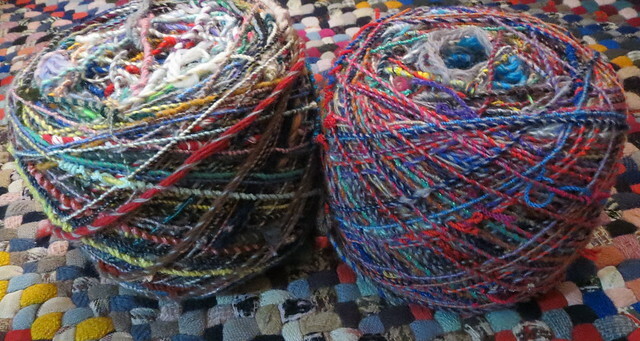 I just grabbed random pieces of yarn and spun them in where ever they wanted to go. 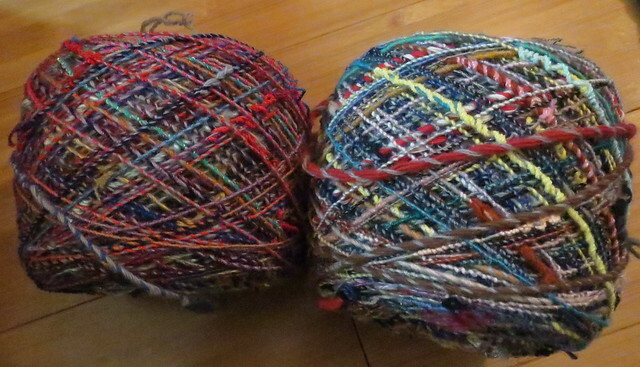 The yarns are all different weights but when I spun them up they all came out as sock weight. 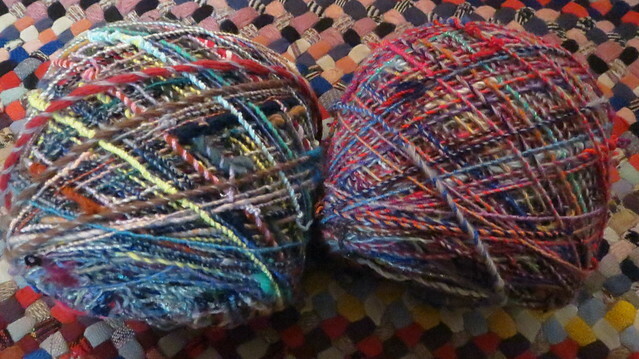 So I am making a pair of matched yet mismatched gloves out of some of the yarn. The reason I say match/mismatched. Because there are no two samples the exact same and because they were fed in randomly to the spinning wheel there is no way they can ever look the same but yet they will be a pair. I have one mitt done and the other half done. They will be a hand-wash lay flat item. 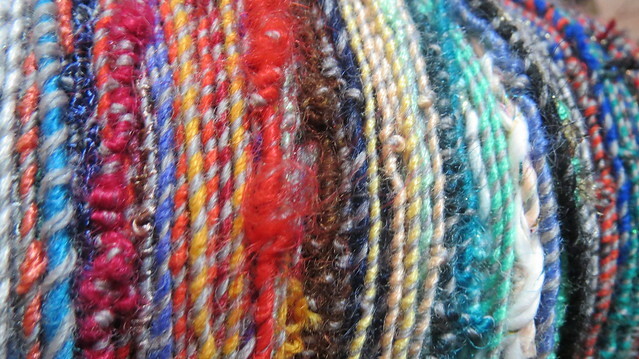 For one because of the wool and I do not know if it will shrink. That is the bad thing about buying things at second hand stores you do not have the care labels intact still most of the time. I am not worried about the little tuffs that stick out here and there I can work them to the back of the work or just let them hang and add their own personality to the work either way I am happy with the end results. Absolutely love it. Don't you just love when the light bulb goes on like that. Makes you feel so creative. yes and it is fun thank you for your compliment.